Week 25 wasn't that difficult on the surface. You could've backed the two teams with two home matches and had no problems. Yet most of the bigger names like Diego Valeri and Zlatan Ibrahimovic failed to live up to expectations due to matchup or not playing. LA FC defenders ended up leading fantasy scoring, with goalkeeper Tyler Miller at the top of the list and D.C. defenders not far behind. Wayne Rooney and Luciano Acosta were the best attacking plays, while Carlos Vela reached 11 fantasy points and still dropped $500K in price. Only one team has two matches in Week 26, which means the Red Bulls should be a favorite for the armband. They take on their rival NYC FC on Wednesday, but more importantly host D.C. United on Sunday. Anything can happen in the battle for New York, but the D.C. match should produce a couple goals. Daniel Royer has turned into their top scoring threat with five goals and an assist in the last four matches, though he's extremely hard to trust after playing 90 on Saturday in Vancouver. In fact, it'd be wise to check New York's lineup before confirming your captain Wednesday. The same goes for Kaku and Bradley Wright-Phillips, as neither started both matches in the previous double. Wright-Phillips has been the better play, with a goal or assist in his last six starts, while Kaku is fading and hasn't often played more than 75 minutes. If Wright-Phillips starts Wednesday, I'd move him to No. 1, though there's no guarantee he starts against D.C. The bold captain would be to go defensive with either Tim Parker or Aaron Long, the two likeliest to start both matches. With a huge floor of three points, Long is the better pick. Unfortunately, there aren't a ton of matches that stand out for everyone else. Josef Martinez is a guarantee to score in every game at this point and even on the road, he'll be a top choice, especially against the non-existent Orlando back line. Orlando are worse on the road, but they've still allowed multiple goals in five of their last six at home. 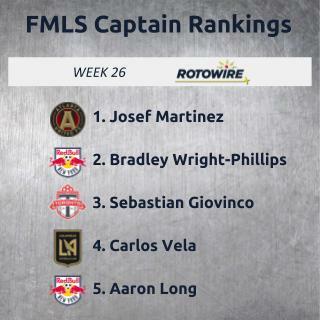 There's also no reason to captain anyone else on Atlanta with how dominant Martinez has been. Home-field advantage doesn't exist in the battle for Los Angeles and that leads to Vela, who has a higher floor than Ibrahimovic. Those teams have combined for 11 goals in their two meetings this year, so you know one of those guys is getting a brace. Sebastian Giovinco finally makes an appearance in my rankings, as he's quietly scored or assisted in his last eight appearances, reaching a minimum of six fantasy points in each of those starts. At home against Montreal, this is a perfect time to ride with the Italian, and Toronto in general. Victor Vazquez sat last match in San Jose (due to the Canadian Championship) and should be ready for a goal and assist against the Impact. There aren't any other teams that stand out, unless you want to back someone from the hard-to-predict Sporting Kansas City attack or hope Graham Zusi can assist and get a clean sheet. Portland are at home, yet they've had a brutal week of traveling and get a Seattle team that has won its last six. Because of that, I may consider Nicolas Lodeiro on the road over Valeri.